Can you skip isolation exercises? Isolation exercises unlike compound exercises do not increase overall strength, they do not help you burn a lot of calories, and they do not have an after-burn effect. These are the main reasons offered against them. Many trainers go far enough to even recommend only doing compound exercises and skip isolation exercises all together. Any time we take an idea too far, it back fires. Pull-ups are a fantastic upper-body compound exercise, and it looks cool. However, many cannot do pull-ups and there are those who rely on pull-ups only and skip isolation exercises like a hammer curl. Then a nagging pain in the edge of the elbow shows up and gets worse over time until pull-ups become a thing of the past. If compound exercises were all that was needed, what gives? That nagging pain at the outer edge of the forearm is more than likely brachioradialis muscle that helps bend the elbow and one of the weakest links in the chain of muscles needed for pull ups. Isolation exercises like a hammer biceps curl can help strengthen this weak link. 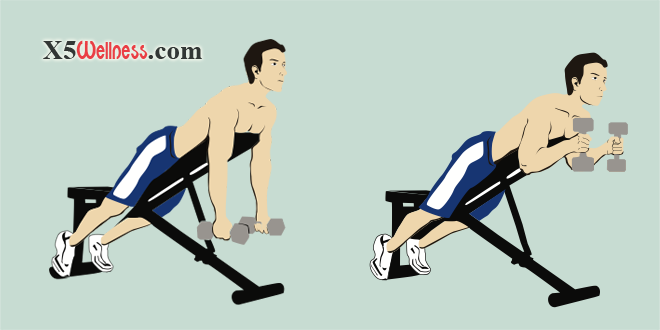 To perform an incline hammer curl lie on an incline facing the bench (prone position). Holding dumbbells with palm in neutral position (facing the bench). Keep your elbows stationary, exhale and curl the weights to full contraction by moving your forearm only. Do not swing the dumbbells up. You can do hammer curl standing up. However, chances of swinging the whole body especially with heavier weights is higher in a standing position. Stationary body is part of isolation exercises. Once you reach full contraction at the top, lower your hand slowly. Complete the reps matching your goal and switch hands. Complete the sets matching your exercise plan. As your weak links strengthen, your entire muscle chain performance improves. Without isolation exercises, you could spend a lot of time nursing and treating pains and injuries in small muscles groups like brachioradialis. Just remember that taking any idea too far back fires. That includes isolation exercises and compound exercises. One manifestation of mental, emotional and physical balance is not taking any ideas too far.